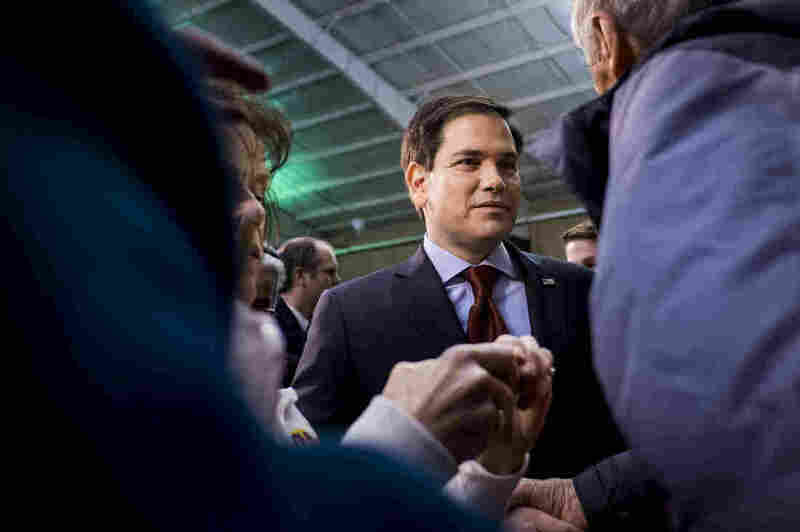 Iowa Caucus Results: 6 Things That Explain How It Happened : It's All Politics Marco Rubio was the surprise beneficiary of heavy GOP turnout and made the fight for evangelicals a three-way contest. Bernie Sanders won with younger voters, but not enough voted for him to win. Florida Sen. Marco Rubio may have finished third, but he had a better-than-expected night in Iowa, thanks in part to larger turnout and evangelical voters. Donald Trump thought he could upend Iowa caucus traditions. The gamble didn't pay off. Hillary Clinton hoped she could wipe away her campaign nightmares of eight years ago by posting a solid win over an insurgent Bernie Sanders. Instead, her margin of victory over Sanders was vanishingly small. Those were just some of the surprise twists from Monday night's results. Here's what the numbers and results tell us about how and why they happened, according to our analysis of the entrance/exit polling and the county-by-county results. 1. Huge turnout didn't just benefit Trump — it also helped Ted Cruz and Marco Rubio. The conventional wisdom before Monday night was that a surge in new voters would benefit Trump, who was working to attract first-time caucusgoers and nonconventional voters. Indeed, a record 186,000 Republicans caucused Monday night. But the 65,000-voter bump from four years ago didn't translate into a Trump victory. According to entrance polls, 45 percent of GOP voters said this was their first caucus, and of those, 30 percent voted for Trump. But an even larger chunk ended up splitting between Cruz (23 percent) and Rubio (22 percent). 2. On the GOP side, it was a three-way race for evangelical voters. The bombastic billionaire had proclaimed for weeks that "the evangelicals" loved him and that he'd triumph with religious voters. Hoping to solidify support in Christian conservative country, he campaigned with Liberty University President Jerry Falwell Jr. in the northwest part of the state in the closing days. But to Cruz's advantage, the number of voters identifying themselves as born-again Christians jumped 7 points since four years ago, from 57 percent to 64 percent. And of those voters, Cruz captured 34 percent. Trump was just narrowly their second choice with 22 percent. But it was Rubio who performed much better than expected to get 21 percent of the evangelical vote. So for all the predictions that it was a two-way battle for evangelical support, the Florida senator — who was stressing his own faith in last week's debate and on the trail in the final stretch — was just as much in the hunt and made it a three-way contest. 3. Ground games and retail politics still matter. Both Cruz and Rubio ran conventional Iowa campaigns — you go to coffee shops, Pizza Ranch restaurants and county meetings, press the flesh and woo voters over to your side. They spent days in the state, on bus tours and retail campaign stops. Both senators touted their sophisticated get-out-the-vote operations, with modeling and targeting. Cruz even brought in so many volunteers to the state, they rented out dorms they dubbed "Camp Cruz." And Rubio took to the air in the final days, running a 30-minute version of his stump speech statewide. Trump, meanwhile, kept trying to fend off questions about his ground operation and whether the huge crowds the reality-TV star drew would translate into enough votes for him to win. He only recently started running television ads, relied largely on free media and flouted traditional rules by not going to the final Iowa debate. In the end, the gamble and his approach didn't pay off. 4. Rubio peaked late at just the right time. The Florida senator had a strong debate last week, especially without Trump on stage after Trump boycotted the debate due to his feud with Fox News. Meanwhile, Cruz was the target of his rivals in Trump's absence. That equation contributed to Rubio's peak at just the right time. Of the 35 percent of voters who said they'd decided in the last few days, 30 percent of those went with Rubio, 25 percent decided to caucus for Cruz, and Trump got just 14 percent. Among the 64 percent who had made up their minds much earlier, Trump and Cruz got 30 percent each. Rubio also performed well in the suburbs — racking up big margins in the counties around Des Moines and around Davenport in the eastern part of the state, strongholds of Mitt Romney's four years ago. 5. Sanders couldn't replicate Barack Obama's 2008 youth coalition. The Vermont senator just couldn't match the strength of the youth vote that Obama marshaled in 2008. Just 18 percent of the vote came from 17- to 29-year-olds — down from a 22 percent share eight years ago. Among those, Sanders dominated, winning 84 percent to Clinton's 14 percent. The good news for Clinton was that 60 percent of caucusgoers were over the age of 45 — and she carried them easily. Among voters 65 and older, Clinton had a more than 2-to-1 advantage. Most Democratic voters had attended the caucuses before, too. Just 44 percent said this was their first time caucusing, down from 57 percent eight years ago. Among those voters, Sanders had a 22-point advantage. Clinton, meanwhile, won the 56 percent who said they were returning caucusgoers by a 24-point edge. 6. Clinton still has a problem with liberals and progressives. But what Sanders did do was bring in more liberal voters to buoy him. Twenty-eight percent of voters described themselves as very liberal — a 10-point jump from 2008. Sanders won those voters by 19 points. Clinton had a 6-point edge with the 40 percent of voters who described themselves as somewhat liberal. Her real strength was with middle-of-the-road Democrats — but unfortunately for her, that share had significantly dropped. This year, just 28 percent of voters identified themselves as moderates, down 12 points from 2008. She had a 23-point edge over Sanders with that bloc, though.